I love, love, love vintage postcards! I have a small collection of vintage dachshund postcards, and also a few postcards from favorite family vacation destinations from my childhood. Vintage postcards are fun to collect, to frame, to save in a decorative box, or to give for a unique, thoughtful gift (framed or tucked into a special greeting card). This love of vintage postcards led me to open a postcard department in my store, Birdhouse Books. I have cards featuring dogs, cats, Christmas, Easter, Valentine's Day, and lots of Roadside Americana (motels, restaurants, stores, amusement parks). 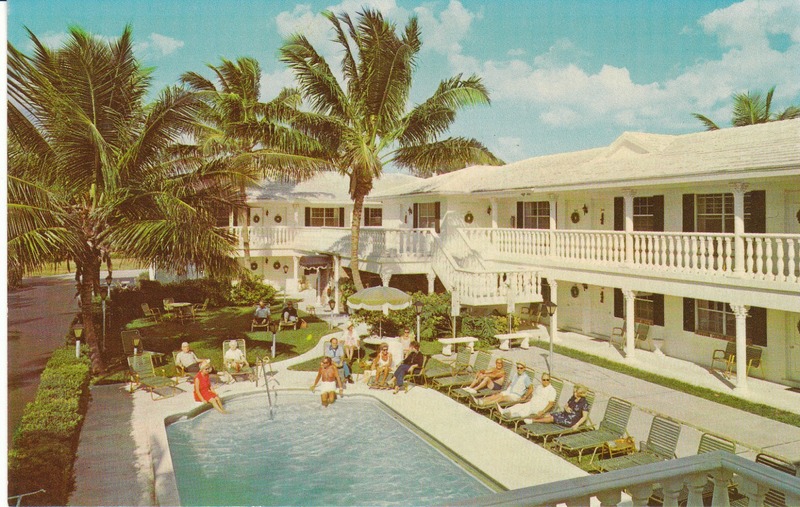 The postcard above features a swimming pool at the Carriage House Resort motel in Deerfield Beach, Florida. This looks exactly like motels I remember staying at during my childhood! I'm hosting a vintage postcard giveaway on my blog. It's easy to enter with the Rafflecopter form below. The contest will end on Tuesday, June 10, at 11:59 PM. On Wednesday, June 11 I will use Rafflecopter to randomly draw a winner. The winner will receive a vintage postcard valued under $10 from my shop. (Winner selects their favorite postcard in this range.) You'll see all the great cards in this price range here: vintage postcards at Birdhouse Books. I love the Vintage Postcard Party Invitation Girls in White Dresses With Blue Satin Sashes. We're having a tea party for my daughter and this would add a lovely touch framed on a table. I love the Imperial 400 Motel - Sioux City, IA postcard. It's definitely not your typical picturesque landscape photo you usually think of. I like the old woman who lives in a shoe! I think I'd pick the giant egg being pulled by chicken 1907 card. I really like some of the holiday cards. Tough choice but I love Savannah's Juliette Gordon Low birthplace remembering many wonderful childhood memories from that trip! I like the Vintage Postcard Christmas Holly 1924 Whitney Made Card Holiday PC I think it will look so nice framed. Pentecost couple walk home http://www.ebay.com/itm/Vintage-Postcard-Merry-Pentecost-Couples-Walk-Home-Church-Mailick-/350865810172?pt=Postcards_US&hash=item51b13b62fc. I think it would be beautiful framed! I'd love to win the children decorate cart wagon postcard. I would love to win the Vintage Postcard De Ville Motor Hotel Des Plaines Illinois Motel IL Chrome PC. I lived in Des Plaines for over 25 years and will have to find out where this was. It looks so familiar. Thanks. The Pirates' House Restaurant is really pretty :). I especially like the pretty Dutch cards! This one is a favorite: Vintage Postcard Children Decorate Cart Wagon with Flowers Dutch Child Card. I really like the "Vintage Postcard Little Girl Bathes Cocker Spaniel Puppy Continental Dog Card." My favorite is the Vintage Postcard Elsie the Cow Elmer Beauregard Borden's Foods Advertising Card on page 13. I collect all types of advertising signs...this would be perfect! Thanks! I like the Postcard Longhair Dachshund Puppies Outdoors Dandelions Continental Dog Card. So cute!! kristiedonelson(at)gmail(dot)com Thank you!